THROUGH IMPROVED ACCESS to information today - many purchasers of handcrafted signs have become aware of the sustainability and weatherability issues related to carved wood signs. Most have also heard of the alternative substrate of choice - High Density Urethane - and many ask for HDU by name or description when ordering a carved sign. An informed customer gets the best value for money and this move toward HDU faux wood signs is going in the right direction. However 'buyers beware' all HDU signs are not created equal. After making HDU signs for many years and monitoring how they withstand normal weather, extreme weather, vandalism and other challenges in the field - Our team at Danthonia has learned some important things about HDU sign construction. HDU is closed cell foam that is waterproof, insect-proof and fire retardant. It carves, paints, and machines like a wood sign - with the exception that it has no grain - so splintering will not happen during production as the sign is carved, shaped or sculpted. Your HDU sign will also not split, crack or rot when installed out in the elements. This is all good. In our experience under normal weather conditions an HDU sign may last 4 to 7 years longer than a comparable wood sign before refurbishment is needed. One down side though, is that not all HDU panels have the same dent resistance as wood. HDU with an 18lb/cuft density has about the same dent resistance as traditional sign-making woods like Redwood or Western Red Cedar. But many sign makers cut costs by using 15lb or even 10lb density HDU. As density gets lighter the substrate is easier to dent, scratch or puncture during handling and installation. In the field these signs are more vulnerable to hail or gravel thrown up by traffic or mowers. For dent resistance comparable to a wood sign insist on 18lb density HDU. Another caution is that even denser HDUs lack the impact resistance of a wood sign. Some years ago I saw an HDU sign that had been hit with a bottle thrown from a car. The impact must have been at high speed as the bottle went clear though the HDU taking a large chunk out of the sign. HDU alone is not very impact resistant. 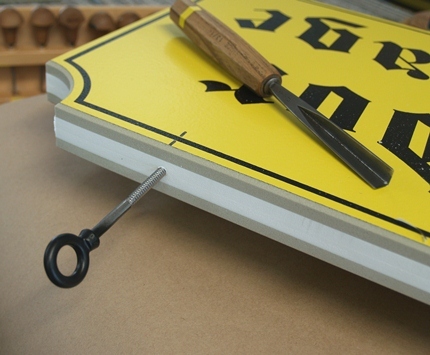 Some sign makers add strength and rigidity to their HDU signs by laminating plywood to the back. This makes the sign stronger but even marine plywood is still wood and brings back the weatherability issues. Plywood also shrinks and expands at a different rate than HDU and may eventually delaminate from the HDU. After extensive testing at Danthonia we have settled on using an HDU/PVC lamination on our signs. Our HDU is Signfoam3, the PVC is Celluka foam PVC. We use 3M adhesives applied with a purpose built pinch roller. When we make a wall sign the HDU has a PVC backing. 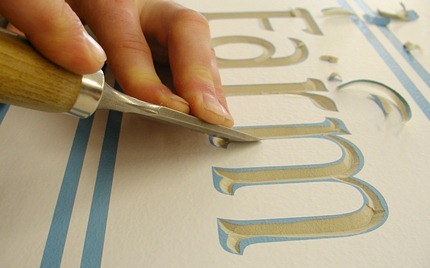 A hanging sign will have two HDU faces laminated to a PVC core - this prevents warping. The rigid PVC is as water proof as the HDU and has the same thermal expansion coefficient. We have been monitoring signs using the HDU/PVC construction for 14 years now and see no significant structural deterioration in the field. Many thousands of our signs hang in Australia. This is a tough testing ground because the weather goes from super-hot droughts to frost, to flood, to cyclone and back again with some of the highest UV readings on the planet. We have also shipped HDU/PVC signs to very cold climates like Alaska, Minnesota and NT Canada. So we are confident an HDU/PVC/HDU lamination is very robust under a wide range of weather conditions. Another advantage of PVC backing on wall signs and a PVC core on hanging signs is that PVC is very dense and holds hardware much better than HDU. Beware of large signs that are 100% HDU. A large sign is like a sail and normal hardware may pull out of HDU in strong winds. Unless HDU signs are laminated to a backing - they require special techniques to install the hardware using epoxy resin. Not all sign makers bother with this extra effort and their signs may come down in high winds. This flaw goes beyond the annoyance of broken signage and enters into the areas of injury and liability. If your sign maker answers NO to any of the above - you may be purchasing an inferior HDU sign that will experience problems in the long term.